The 30 year-old is expected to sign a three-year deal with the Premier League side. BAYERN MUNICH CHAIRMAN Karl-Heinz Rummenigge has confirmed that the club have agreed to sell vice-captain Bastian Schweinsteiger to Manchester United. The midfielder was out of contract next summer and has been heavily linked with a move to the Premier League side for the last few weeks. Just two days ago, Rummenigge revealed the midfielder was flattered by the interest shown in him by his former boss – Louis van Gaal – who’s now in the Old Trafford hot-seat, adding fuel to the flames around his Bayern future. And today, Rummenigge confirmed Schweinsteiger was on his way. Though the exact details of the deal are not yet known, it was speculated this morning that the 30 year-old would sign a three-year deal with United and that the transfer fee is likely to be somewhere between £12 and £15 million. Shortly after Bayern’s announcement, United made their own. It’s believed Schweinsteiger is in Manchester to finalise personal terms and have his medical while United are still hopeful of tying up a deal for Southampton’s Morgan Schneiderlin before departing for their pre-season tour of US which kicks-off on 17th July with a game against Mexican side Club America. Email “Bayern Munich confirm they've agreed to sell Bastian Schweinsteiger to Manchester United”. 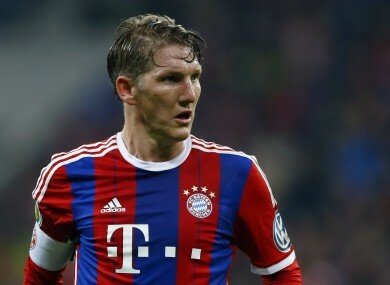 Feedback on “Bayern Munich confirm they've agreed to sell Bastian Schweinsteiger to Manchester United”.